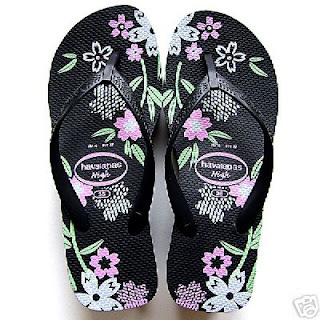 Havaianas, pronounced ah-vai-yah-nas, Portuguese for Hawaiian, is a Brazilian brand that is exported internationally. 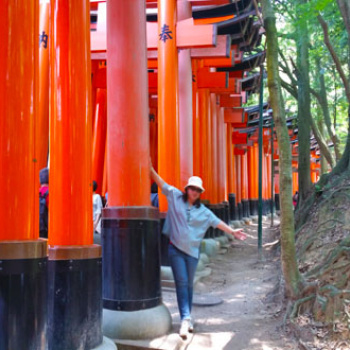 They made their debut in Brazil, inspired by Japanese peasant wear the 'Zori'. 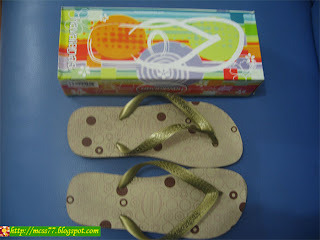 Havaianas is the Brazilian shoebrand designed and owned by Sao Paulo Alpartagas S.A. 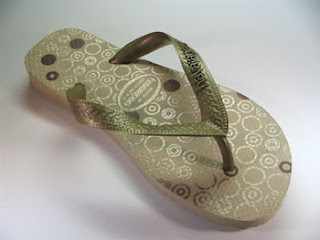 I wasn’t really into Havaianas because it reminds me of the cheap but sturdy Spartan slipper. And being the cheapskate that I am, Havaianas flip-flops are a bit expensive (especially for Asian standard). But as time passes, the Havaiana craze is still growing. Fashionistas are going gaga over these slippers and some of them are actually collectors of these flip-flops. Now, these sandals are worn by blue collar workers, and has already made it to the international fashion forefront of New York, Milan and Paris, gracing the feet of the stars and supermodels. They are seen in the fashion runways and sold at upmarket department stores. My first purchase, Havaianas Joy White (P895.00) - the 2006 collection are inspired by romance, happiness, and the colors of spring and summer. Havaianas Joy were created for who seek this inspiration. This line values fluidity and lightness and includes bicolot sandals, in tone on tone colors. Hibiscus branches cover the fine and delicate straps, and the sole gets a 3cm. 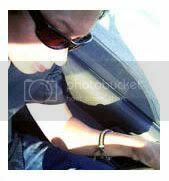 Heel. 2nd purchase: Havaianas Summer Experience / Pois (P895.00) - the name of this sandal derives from the Hawaiian performance art of Poi-juggling. The "Pois" sandal has a metallic strap, and is patterned with circles and dots, giving the flip-flop a classy art deco look. 3rd purchase: Havaianas High Heel Sun Navy Blue (P1,195.00) - high look's innovative technology has enabled Havaianas to develop high heel wedge sandal that is higher, thicker, but lightweight. Height 2 3/8" wedge. All sandals were bought at All Flip Flops in Alabang Town Center.